I wonder if anyone can help me. A couple of months ago I dropped my S7.It was in a case and didn't initially seem damaged as it landed on the side. However I noticed the touch screen wasn't working and the screen began to slowly bleed from a minuscule crack under the glass originating from where the phone landed on the left hand side. Eventually the screen was fully black. I got the LCD repaired 3 days ago for £175 and it worked fine. Today I had the phone in my pocket at work and I was listening to a podcast on headphones. I went to pause the podcast on the lock screen and noticed the touch screen wasn't working. I unlocked the phone with the fingerprint scanner and noticed a tiny blue dot and when I held it to a light I noticed a similar thin crack originating in the same place as where it had previously been. The screen then bled the same from this crack. 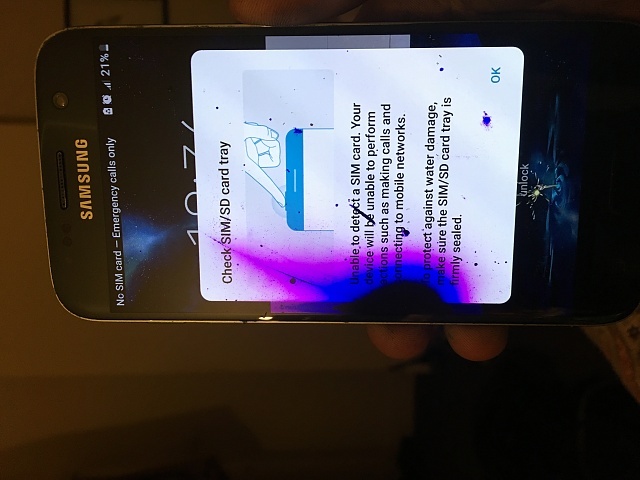 I took the phone back to the shop on my way home and asked if it could be an installation issue as I'd not dropped it and the crack was in the exact same place as last time (though a less severe crack this time) The guy said it was impossible as they use tape and official Samsung parts. He then pretty much said I was lying and that the bleed was in a different location last time and I must've damaged it. Has anyone else had a similar problem after a screen repair? Or does anyone know a cause for this type of issue? Is it unusual to happen after 3 days? The phone could have bumped against something in my pocket but I have a good case and I would've noticed a big bump as I'm conscious that my phone is always in that pocket. I've posted a pic of the phone to show where the bleed is this time. My PC sees my phone as full(in terms of storage) yet I have 1 gb of free space? Buy from Samsung, Best Buy or ATT? My Samsung S6 Keeps on Freezing - Process System is Not Responding.